An emotional support animal is exactly what the name says: an animal who provides emotional support. It's something I had heard about from college friends who wanted an excuse to keep a furry friend in their apartment, but I never thought it was a legitimate thing. Kendall Surratt College student, avid coffee drinker, aspiring to inspire others. Just a few days ago, I celebrated my one-year anniversary with my cat, Lucy! If I could make the blog entirely about her, I would, but I already have devoted my Instagram and Twitter to her :) One year ago, I took a big step and moved to my own apartment. This truly was the first time I have ever been totally on my own. I knew I'd be lonely, but I didn't think much of it at first. This was just something that would be beneficial for me. I visited my doctor a few weeks earlier, and as we were discussing new treatment options for my anxiety and depression, she asked me what helped me calm down. I told her I really liked to pet animals, and I frequently spent my afternoons at the local humane society. That's when she said the best thing, "Have you thought about an ESA?" ESA stands for emotional support animal. Take note that an ESA is NOT a service animal. (We'll talk about the differences later on in this post). 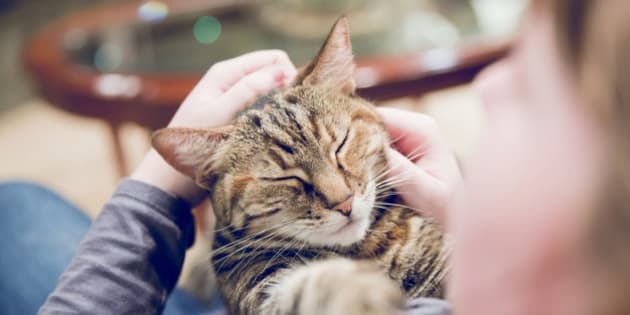 An emotional support animal is exactly what the name says: an animal who provides emotional support. It's something I had heard about from college friends who wanted an excuse to keep a furry friend in their apartment, but I never thought it was a legitimate thing. My doctor wrote me a note, essentially prescribing an ESA for me. I had meeting with my landlord later that day, so I brought the note to her and she told me that it was actually a common occurrence. That was news to me. I moved into my new apartment about two weeks later, and I was on my own for a total of three days before I marched into the humane society and brought home my new best friend. I cannot explain how beneficial my Lucy has been to me. Like any cat, she wants constant attention, doesn't leave me alone, and is always getting into things she shouldn't. It's pretty similar to having a small child, but less clean up. Lucy has had two or three previous owners, all of whom gave her back to the shelter for unknown reasons. That feeling of not being wanted is something we share, and it makes me feel like she actually understands me. According to the Americans with Disabilities Act (ADA), an ESA differs from a service animal because they are used to only assist in improving overall functioning for the handler. This contrasts with a service animal because the service animal performs tasks that benefit the handler. The ADA also limits service animals to dogs, while ESA's can be any animal that benefits the handler. While ESA's provide support, service animals can also be of benefit to those with severe psychiatric disorders such as post-traumatic stress disorder (PTSD). After having Lucy for this long, I can tell you that she has been so beneficial for me throughout the journey to better mental health. I now know how many alternate resources there are available for improving mental health. I encourage you to explore your options, either by yourself or with your doctor (if you have one). I also encourage you to always choose the best option for you. My parents said that I was crazy when I told them I had a "prescribed" cat for my anxiety and depression, but they now know that she is so much more than a pet. The only thing that matters in your mental health is you, so please try to choose the treatment plan that fits you. For more information on ESA's, you can visit the National Service Animal Registry. They list all of the definitions and qualifications for having an ESA. And as always, you can talk to your doctor about this kind of treatment plan.